“When the water first switched over I remember taking a shower and I’m like, it smells so funny in here. I’m like, it’s not me, it’s the water. The water got switched today. Told mom, mom this water its not right. And I remember probably like a few months after that I started getting rashes, all around my neck mainly. My neck would turn a bright red and it would just be stinging and burning and then it would dry up and start getting flakey and just still burning. Then I went to my dermatologist, and she’s like we don’t really know what it is. All we can do is give you these creams and hopefully something’ll clear it up. And I’m thankful that something did clear it up but it was painful to go through those rashes. Now I know not to stay in the shower more than five minutes. Probably two minutes, do what I gotta do, jump in and hop out.” - Keonna Miles with mother Kionna Miles and nephew Kirk, at home in Flint, Michigan, January 30, 2016. “Several of my family members have been affected by the Flint water contamination. For months we had city officials tell us that it was ok to drink the water. Even showed us that they were drinking the Flint water. We all had different types of illnesses going on but we never thought it was from the water. I done had several upper respiratory infections. I done had skin rashes, hair loss. We cooked with the water, we bathed, I’m worried about two, three years from now, what else is gonna come up. Cancer. 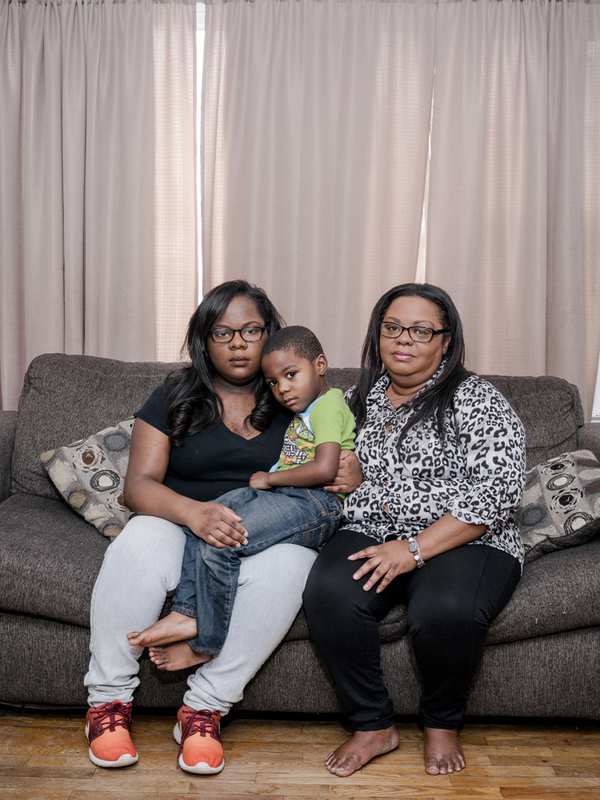 I’m worried about how it done affect the inside of my body that haven’t come out with the different tests yet.” – Antonette Miles, with daughter Keonna Miles and grandson Kirk, January 30, 2016.